In recent years, sycophancy has often led to paucity of quality in the documentation of musicians on film. From John Lennon to Bob Marley and on-wards, film-makers have shown little in the way of criticism of their subjects, instead choosing to glorify and mythologise their leads in a way which is both PR and VH1 friendly too. Exploration of individuals' minds is of no concern and, instead, the movies exist solely as long form advertisements for greatest hits packages or upcoming tour dates. It's reached the point that the most gritty, and easily the best, of modern day mainstream musical documentaries has come in the form of a self-produced documentary by Katy Perry. How then, do we solve a problem like The Boss? Making a feature film about Bruce Springsteen is always going to be a tricky task due to the problems mentioned above - he means so much to so many as a rare musician who is as vital now as forty years ago - that it would be impossible not to frame him in terms of abject reverence. The sheer mention of his name alone invokes wild stirrings in his most devoted fans and any attempts to make a documentary which did not address this would be foolish. 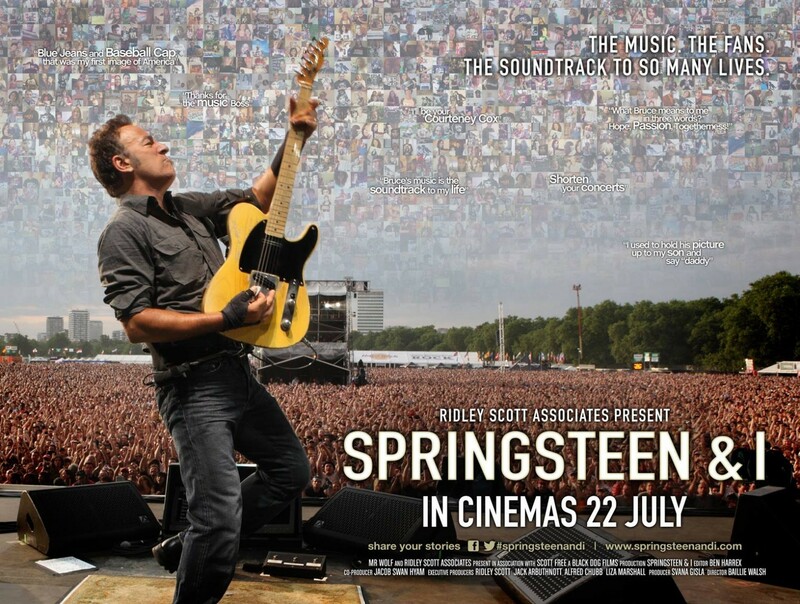 Thankfully Springsteen & I's director, Baillie Walsh, makes the wise choice of realising this was not much of a problem after all but rather a unique opportunity and, ultimately, crafts a film which is as much about fan devotion as it is about Bruce Springsteen. In fact, over the course of the film's running, we get to learn little, if anything, new about The Boss - rather we spend our time in the company of a wildly diverse bunch of fanatics, each with their own story (or two) about what Bruce means to them. Despite the fact that Walsh's fan generated film has so much content to choose from (as thousands of videos were submitted), Springsteen & I never provides a definitive answer to why Bruce is so enduringly popular - partially because the singer means so many different deeply personal things to so many that trying to nail it down would be impossible, and partially because the question itself is more of a gateway to meeting a whole array of charismatic individuals who may not otherwise have become the subject of a documentary. This would have been a great shame. In the same way that Springsteen's songs gives voices to characters who may have otherwise remained voiceless, the salt of the earth individuals not usually thought glamorous enough to become the subject of pop anthems, Walsh's endearing film shines a light on a rag-tag cast of remarkable individuals who may have otherwise been passed over for cinematic productions. As the likes of Erroll Morris understand and Werner Herzog understand, there's few things more fascinating in movies than pointing the camera at individuals and simply letting them talk - oftentimes the subject will find themselves opening up to thoughts they never realised they had, stumbling across deep wisdoms they'd feel embarrassed to pronounce under other circumstances, and accidentally spilling a bit of their soul for all to see. Whereas, in Gates of Heaven, Morris uses pet cemeteries as a starting point for his subjects to ponder life, love and their place in the universe, Walsh offers us Bruce Springsteen. Here, we meet Kitty, a Masters graduate who can't find any work outside that of manual labour and truck driving - she uses the music of The Boss to help her make sense of her place in the world, the dignity he bestows on the working class providing daily solace to her. There's John, a charming Danish man, who recalls with gleeful abandon the night he saw Bruce as a 9 year old boy and how the tape recordings of that night symbolise something truly special in his soul. There's the lady who says she's been friends with Bruce since the mid 80s... despite their never having met. A talking head states of Bruce's lyrics that they are "like looking through someone's family photo album and looking at their life and smelling their coffee … and feeling their sadness … and they're triumphing." He then begins to sob uncontrollably. There's also the man who appears to love his wife to the same degree he has an apathy for The Boss's gigs - if he ever met him, he would offer Bruce the following advice: "Shorten your concerts". As the film concludes, the best speculation I can mount as to where Bruce's mythologized popularity comes from is the fact that, as one fan pointed out, he's "one of us" - he's like you or I but, crucially, he's the best you or I we could ever hope or aspire to be.. and it's through this hope, he gives us dreams we'll always cling to and be grateful for. Springsteen & I showed a collection of idealists around the world, some of them crushed, some of them fulfilled - using Bruce as a backdrop is a fantastic excuse to visit some of these broken heroes and those in the throes of their glory days too. In short, all human life is here - Walsh's film fluctuates from melancholic to life-affirming, deep to ludicrous (the moment an Elvis impersonator takes charge of a Bruce gig is rather winning), yearning to fulfilled. It's a beautiful patchwork of human beings at their most intimate and a lovely reminder of what documentaries can be when they strive to be more than VH1 specials. And it's also worth noting that the documentary has one hell of a killer soundtrack. Thanks Bruce. For everything.